Krungthep is awash in restaurants started by youngish members of high society who have a fair amount of cash, lots of ego, and little to no experience running restaurants. Heck, many of them wouldn’t even qualify as foodies. So a few weekends ago I was a bit apprehensive when trying out a new French restaurant in the Thong Lor neighborhood called 4 Garçons. Located on Soi Thong Lor 13 in the warren of small alleys that lead to Samitivej Hospital, 4 Garçons occupies a generous space on the ground floor of the recently-opened Oakwood service apartments. The four young men referred to in the restaurant’s name are four yuppie friends (guppies, too?) who decided their interests in food and wine should be expressed through the opening of a restaurant. It turns out that one of the partners, the one who seems to be managing the front of the house, is the friend of a friend of our dining companions for the night, Ben and Jason. And the partner who is overseeing the kitchen is a doctor that Ben knows from Brumrumgrad Hospital. As Jason observed, it is odd to see your doctor in a chef’s outfit working in the kitchen. In talking with the manager, he explained that the doctor loves to cook as a hobby and throw dinner parties frequently, which was their point of inspiration to go into business together. Somewhere (maybe in Bourdain’s Kitchen Confidential?) I recall reading that being good at hosting dinner parties is not the same as being a chef. Nonetheless, 4 Garçons manages to effectively avoid the curse of most of these hi-so hobby restaurants: lackluster food. 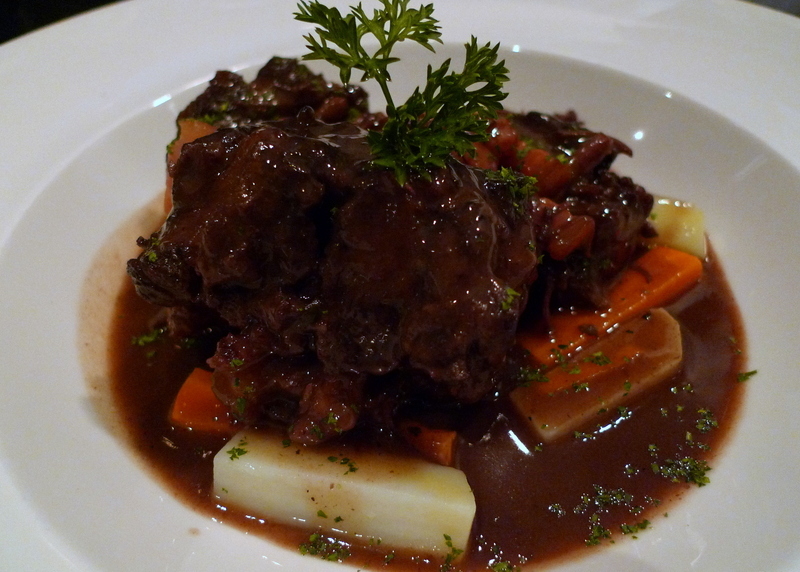 The food at 4 Garçons was well-prepared and tasty, if somewhat lacking in distinctiveness. The interior of the space isn’t its strong suit. Another of the friends – maybe he’s an architect? – did the interior design. The space feels too open to be a nice brasserie and too cold to be a comfortable bistro. Some furniture (shelves? counters? plant stands?) could have broken up the space more effectively, avoiding the long row of tables seen in the first picture and the large open areas that feel conspicuous. Maybe this has to do with the “see and be seen” desire of Bangkok hi-so diners, for whom a more closed, intimate space would have minimized face time. Thinking of other local restaurants like Extra Virgin, though, I think the interior could be improved by breaking it up a bit. Tawn wasn’t keen on the murals, either. 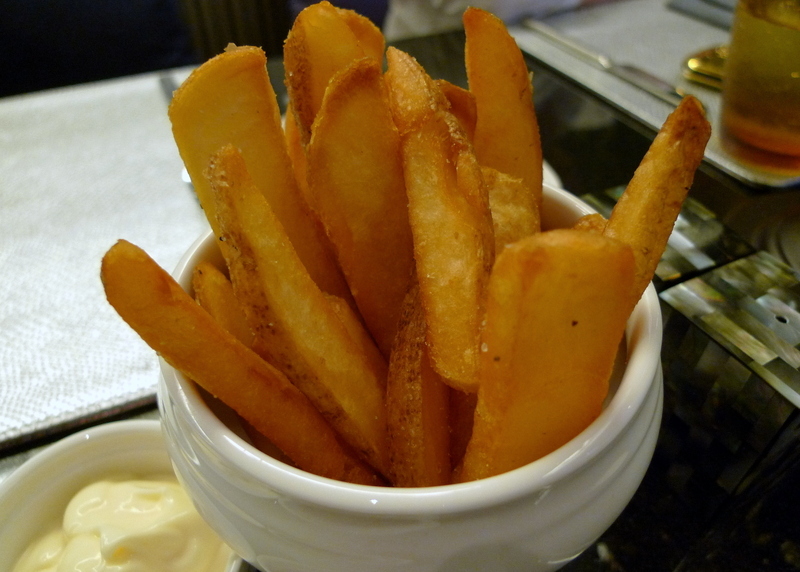 It seems that an order of fries is brought out as an amuse bouche. Steak cut fries seem oddly un-French to me but they were really nice, crispy on the outside, tender on the inside, not greasy at all. Maybe it is a break from the shoestrings frites one expects at a French restaurant, but it is a welcome break. Jason, Tawn, and I ordered some appetizers to kill the hour or so before Ben was able to join us from work. 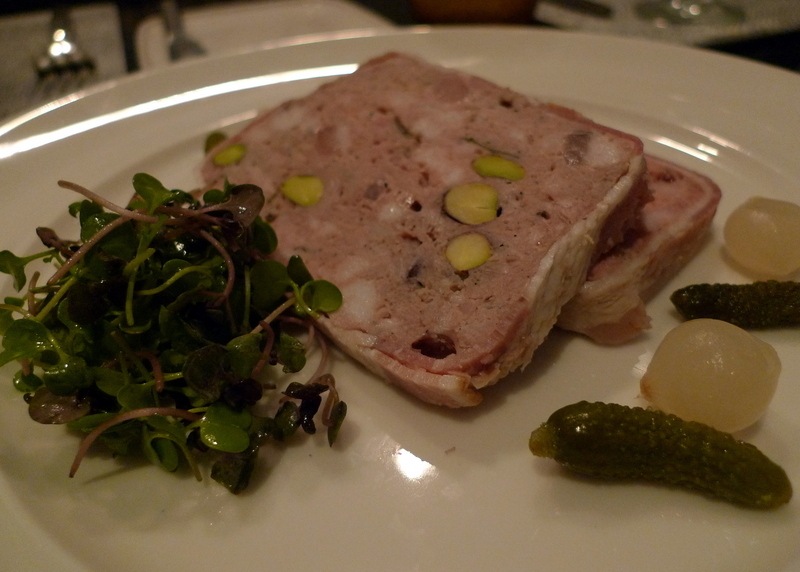 We ordered this house-made pate, which was really tasty. I keep asking myself why I don’t make pate at home. The answer is probably because I don’t have a food processor. But it isn’t that difficult to make and it reminds me of my days as a young child eating Triscuit crackers and Oscar-Meyer liverwurst for lunch with my paternal grandparents. 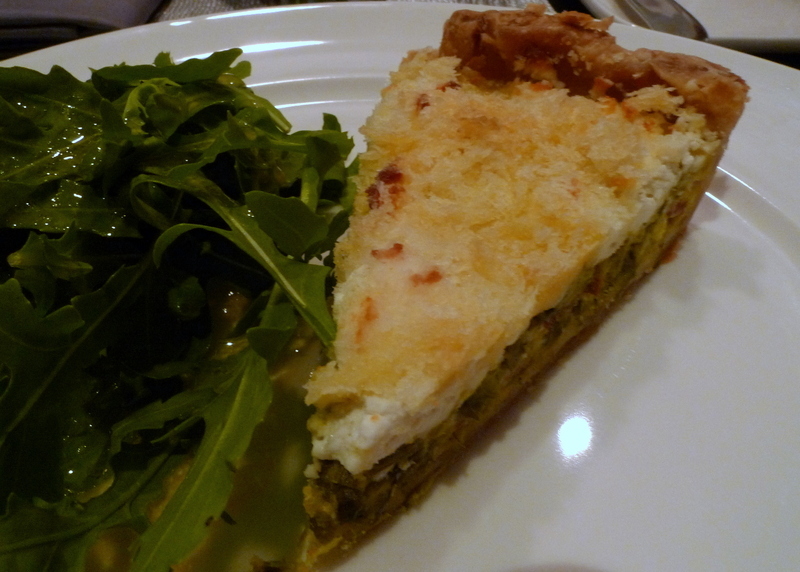 A goat cheese tart with mixed greens was another nice appetizer. Lots of onions and very tasty. 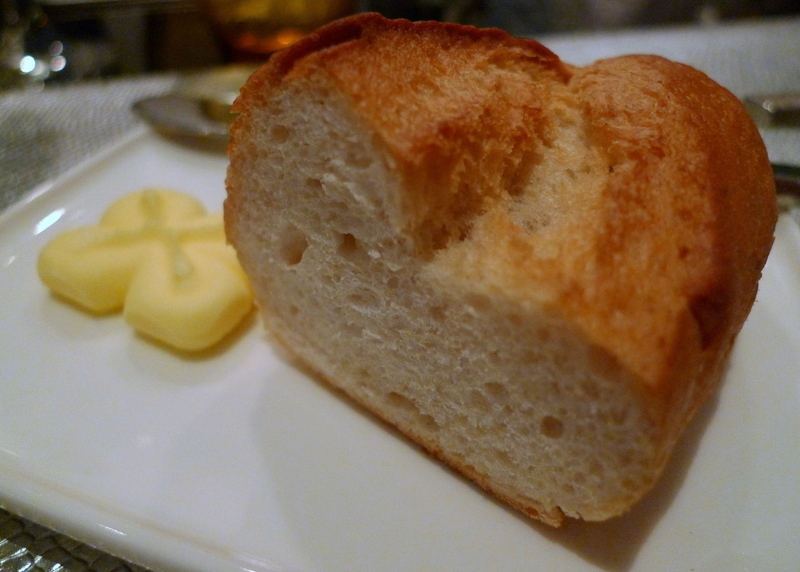 I assume the bread was not baked at the restaurant although it was pretty good quality and it was generously provided. 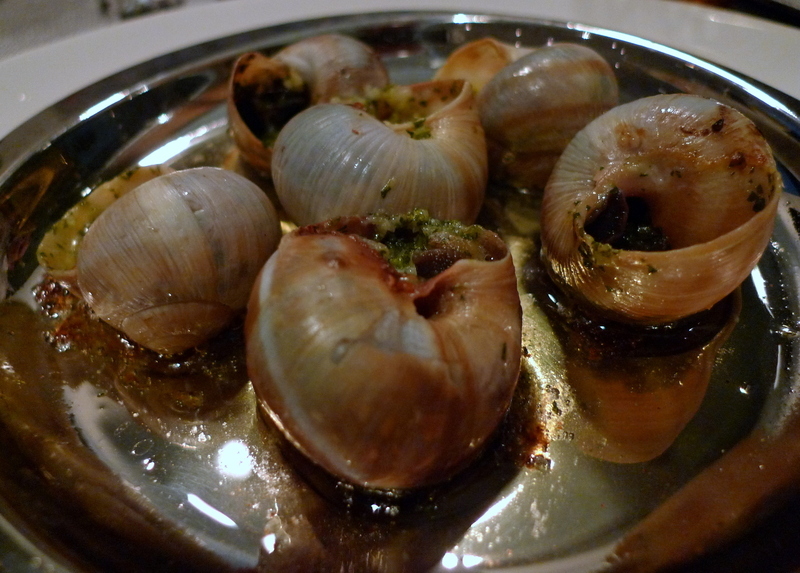 And if you have bread, you need melted butter and garlic to sop up, so we had escargots. These were really tasty and are a good illustration of the principle that anything tastes wonderful if you put enough clarified butter and garlic on it! Service is friendly and attentive, if a bit uninformed. Basic questions like “What’s the soup of the day?” required a pop into the kitchen by the order-taker to answer. It seems like the first lesson from Waitering 101 that you would know that type of information before approaching a table. After Ben arrived we placed our orders. The menu covers all the usual suspects of French cooking without any specific regional focus or stylistic emphasis. 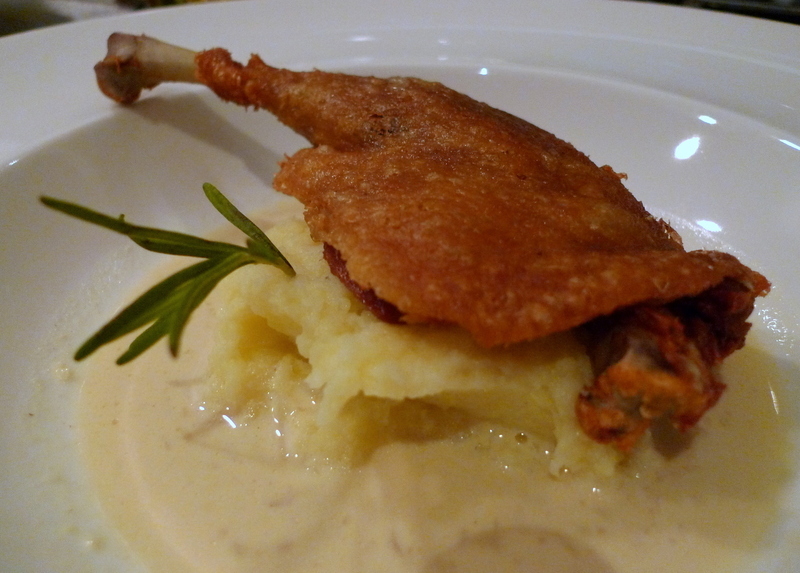 One interesting thing was the availability of duck confit two ways: one prepared in duck fat for 6 hours, the other for 12 (if I have my numbers right). The second one, which Tawn ordered, was saltier than normal and had a “gamey” flavor. It was quite good with a moist interior and crunchy exterior and was worth coming back for. Ben had the beef stew, which was flavorful and very tender. 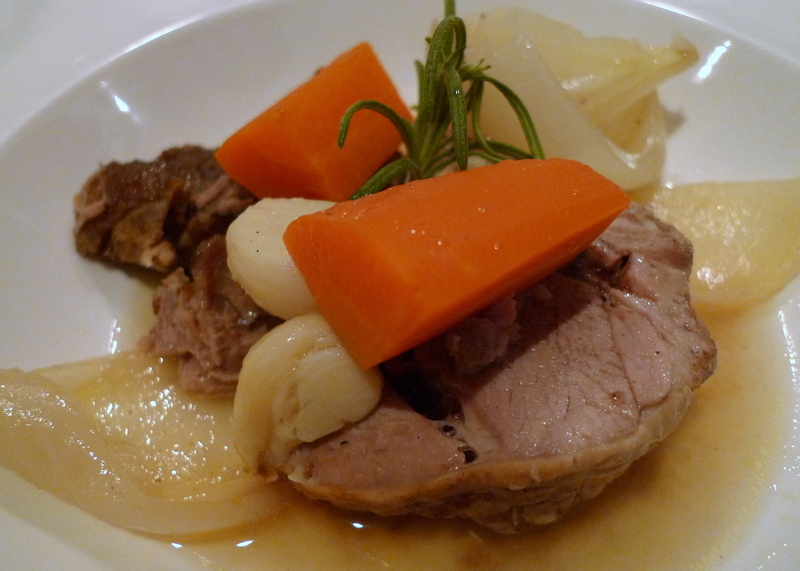 I had the lamb shoulder, which was also tender and flavorful although it had sort of a “one note” nature to it and could have used something – a few olives, maybe? – to distinguish it. 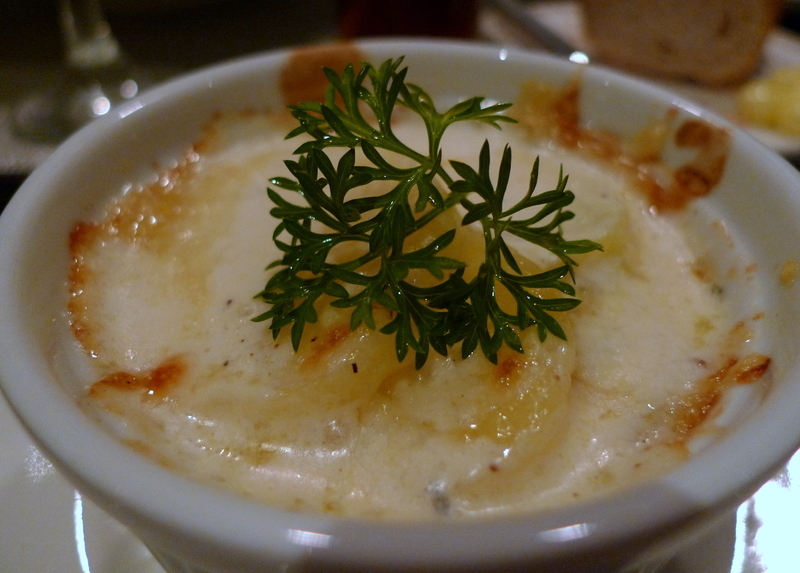 The lamb came with a side of potatoes au gratin, which were tasty but a tad undercooked. Jason settled for the not-very-French choice of pasta with a meat sauce, which he seemed to enjoy. Tarte au citron – lemon tart. The lemon curd was lumpy and uber-sweet without any hint of tartness that makes for a great tarte au citron. A little over-sauced, too. We couldn’t bring ourselves to finish this, one of the rare occasions when I leave a dessert unfinished. A fresh fig tart was was a pleasant find on the menu, something you don’t see often. The figs were lovely but the base of the tart didn’t add anything to them. The amount of saucing was appropriate, though. 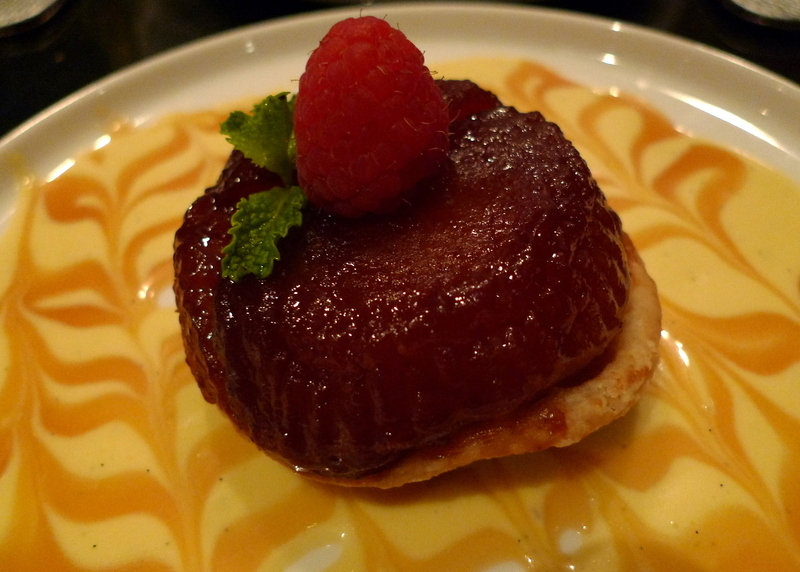 The best dessert was the tarte Tatin. The apple was really lovely and had this luscious caramel flavor. I’d go back just to order this dessert, despite it being lost in a sea of vanilla cream. I wonder if a few grains of coarse sea salt sprinkled on top would have added anything to it? Upon reflection, I realize what marks a major difference between “fine dining” restaurants here versus in the US (and, I suspect, many western countries). The restaurants here seem to have little definable chef’s vision and the dishes come across pretty much as textbook examples of whatever cuisine they purport to represent. It is as if the owner lays out a bunch of recipes and hires some cooks to prepare them – which is what happens at any restaurant – but in this case it seems that the owner either doesn’t put a unique signature on the dishes or else doesn’t ensure that the cooks understand more than just the technical steps for preparing the dishes. In other words, there’s no passion behind the cooking. For what it is worth, 4 Garçons serves up food that is well-prepared and tasty, even if the entrees do manage to arrive one at a time in Thai style instead of all at once as you would expect in a French restaurant. If any of these dishes had been served to me at a dinner party (or had I served them at my own home) they would be very impressive. Put into the context of a restaurant they are still good but fall a little shy of where they need to be in order to make a stand-out impression on diners. 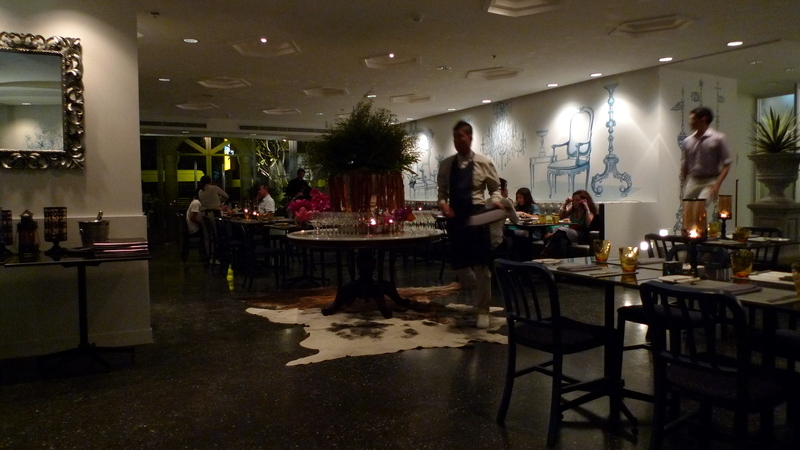 For the price – about 500-700 baht (US$15-22) per entree – the food is a fair value for Bangkok fine dining. When I factor in the ambience, which isn’t the restaurant’s strength, and the quality of the food, I would say that 4 Garçons is a “worth visiting” but not a “must visit” restaurant. I’d like to make a return and see how things shake out as they get into their second month of operations, if for no other reason than to eat the tarte Tatin again! This entry was posted in Uncategorized and tagged 4 Garçons, Bangkok, Dining, food, Krungthep, Thong Lor by christao408. Bookmark the permalink. I guess every new restaurant is struggling for their identity and trying to find their voice. I hope they succeed. I’m looking at all that open space and calculating the loss of revenue / sq ft.
Yumm! The food looks good. I guess the business depends on word of mouth. I also wonder how long these new businesses will last? Would be interested to find out in a few months, right? Boy they don’t hold back the sauce.Hopefully they’ll improve soon and put their own signature on the dishes. wow…the desert is so tempting! @ElusiveWords – The challenge is that if they crammed in more tables, it would become too crowded and loud. They are at a price point that they can’t go much higher than, too, without going all the way to really high end dining. @CurryPuffy – This cadre of restaurants has about six months in which they are one of the “it” restaurants, then the crowd of yuppies moves on to other scenes to see and be seen. There are several restaurants I’ve seen here – including one just across the street from us – that were cute, had a decent menu, and at first seemed like they might have staying power. They became really busy, almost turning into a night spot as the cool people would come and hang out. But now, a year later, things are very quiet and the food isn’t good enough to attract a steady and reliable crowd. Part of the problem is that most Thais of that strata have money, but aren’t really foodies. @yang1815 – They seem like nice enough people so I hope they can make it work. @christao408 – You’re right on about that! I think so too. 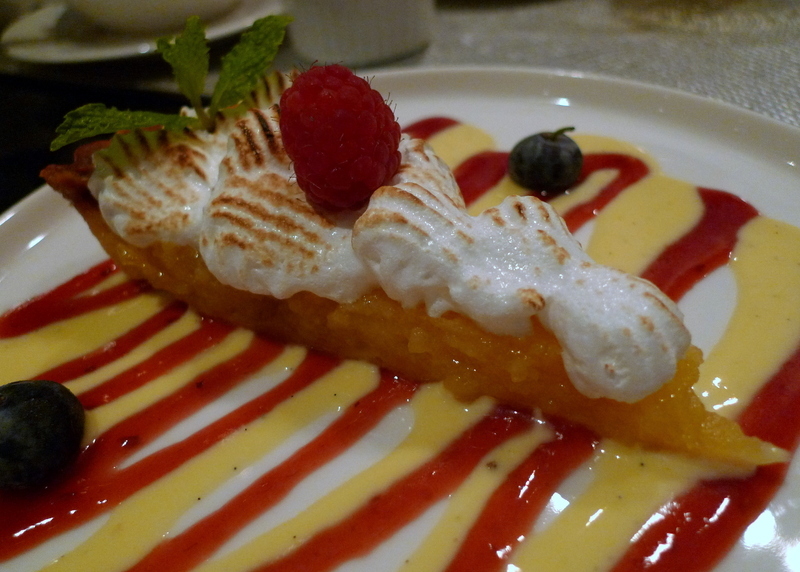 well, the food certainly looks delicious, anyway… particularly those desserts! 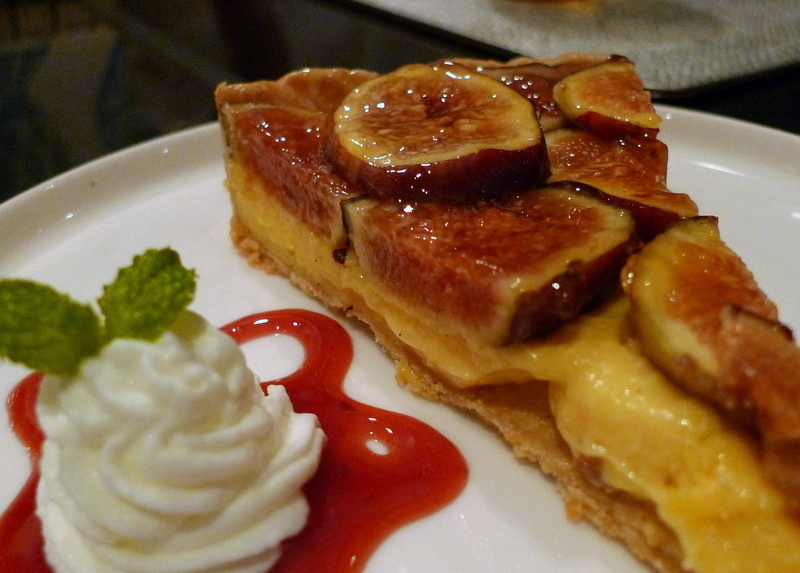 the fig tart intrigues me…. maybe i’ll have to find a recipe and try it. @WilldrawsRainbows – I hope you are, too, although I’m not sure one has to be rich (which I certainly am not) to go to a place with $20 entrees! =D@kunhuo42 – If yours turns out any better, Aaron, let me know and I’ll pass the recipe on to the chef at the restaurant. Ha ha. @Dezinerdreams – It is pretty. @foggysunnymorning – Don’t resist! @elelkewljay – Yuck, my blog has drool on it. Okay-I want to know how you stay so skinny eating all the rich food??? The other thing I don’t like about some restaurants is how tight the tables are. I don’t want anyone to hear my conversation nor am I interested in other people’s conversations. going french in thailand? wow, i wouldn’t mind getting some of those duck confit and tarts. 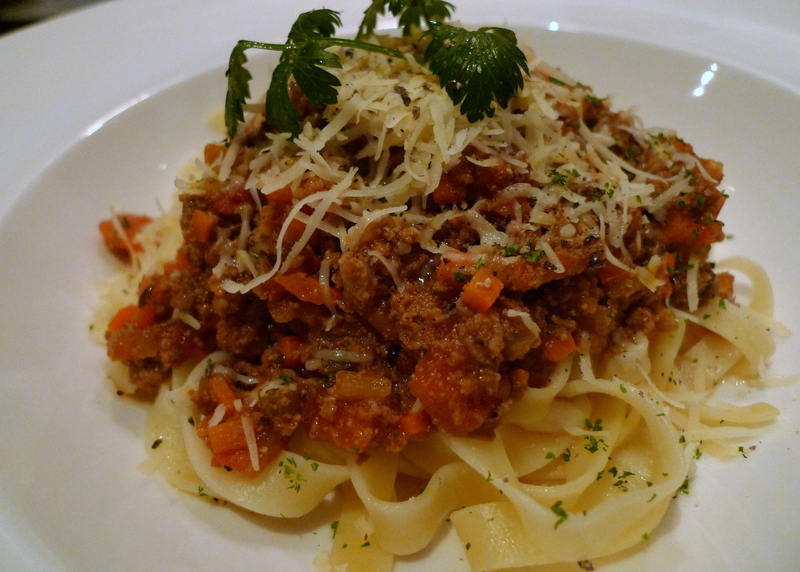 i can never resist pasta with meat sauce!! never never never! and you always put up such delicious ones… oh & i can probably also eat 5 of those tarte tatin..that’s what i feel working at a jean georges restaurant, that the food is prepared without much passion. it’s about the amount of input yielding a certain amount of output. the corporate thing absolutely kills me and that’s why i can’t wait till my externship @ perry street is over. i want to be able to prepare the food with love there, but i just can’t. anyway i digress, and just want to say that that’s a really interesting point you make about the distinction between fine dining in the us and fine dining in other countries..
Ooo, I really need to stop looking at your posts right before lunch. I’m hungry now! @TheCheshireGrins – Surely you know better by now… =D@iskrak – It is interesting to hear that the passion/lack of passion thing exists in kitchens in the US, too. @lcfu – How were they prepared in Vietnam? @rudyhou – Yeah, bad place to go for French food, right? I should just fly to Paris. @kenpcho – Oooh, I don’t know about that. @Wangium – So noble! @rudyhou – He’s been chomping at the bit to return for a few years now. Now all we need is the money and time! well then, whatever your and tawn’s next trip be, forget it and save the money for france. I’m getting hungry looking at all of the yummy food! So jealous! @rudyhou – Sadly, you don’t realize how prescient your words are. More about that later. @swcheng15 – There’s yummy food in San Mateo, too. =D@murisopsis – I’ve been trying to convince Tawn that another visit is in order. He thought it was overpriced for what it offered. really? you got me all curious now. I’ve been to this restaurant three times already since they opened. The food is truly delicious. My favorites are the onion soup and steak tenderloin. And whatever you do, don’t miss the French fries. At least during the nights in which I’ve visited 4 garcon, I have noticed that there are usually a few big groups. That may explain the long table arrangements. On the whole, I agree that the place serves up good value. More like a casual neighborhood spot than a fine dining restaurant, their dishes are priced accordingly. Mmmmmmm . . . . . . I’m salavating just looking at the pictures. The place is absolutely delicieux. @Cici – Well, you could also take them to K Village or J Avenue – both feel pretty much like a strip mall somewhere else other than Thailand! Ha ha! @Susan – Susan, I’m glad you enjoy the restaurant. For the money they charge, I think they fall a little short on the sophistication of the food, but it has been five months since my last visit so maybe they have brought things up a notch. Had dinner at this restaurant tonight and it was packed. They have fabulous sofa lounge areas outside, which seemed very popular with late night drinkers. Thankfully we couldn’t have asked for better weather.Must agree with others that the stews are a must try. Most of what we had is simple food that doesn’t disappoint. 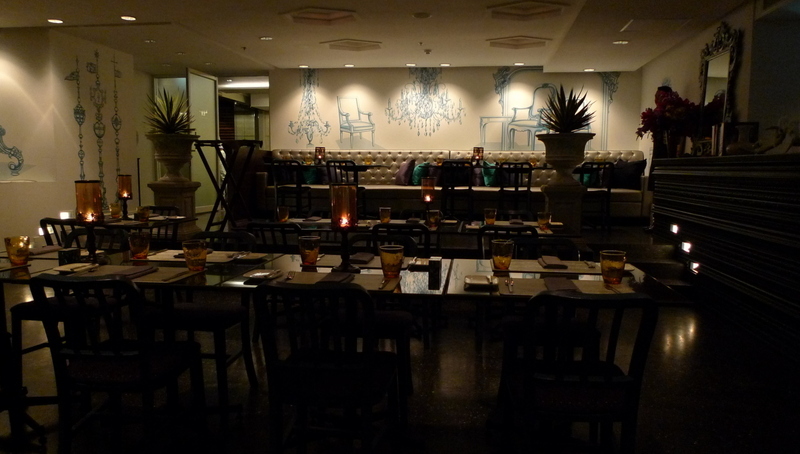 @Nightingale – Glad to hear you enjoyed the restaurant and thank you for sharing your expeiences here.